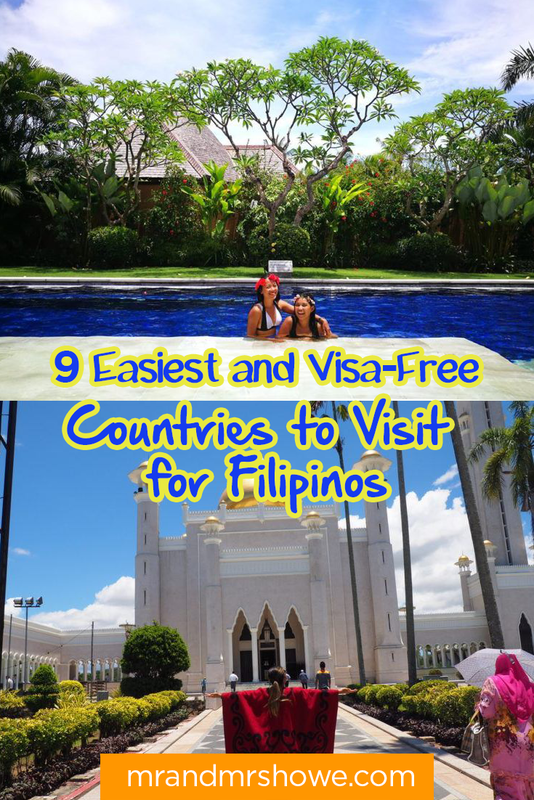 9 Easiest and Visa-Free Countries to Visit for Filipinos - my ASEAN Travel Tips! Filipinos tend to associate traveling with having a hard time obtaining visas. But who says you have to get visas before you can venture on a great overseas trip? Why not start with Philippines' neighboring countries which would not require a visa? You'd probably heard of ASEAN over the news, and you might know a little information about it. Well, let me tell you few more about its members and the benefits we can get as Filipinos. In 1967, the ASEAN (Association of Southeast Asian Nations) was founded to strengthen regional solidarity and cooperation among member countries and aims to create one of the largest single market economies in the world, promoting the free movement of goods, services, travel and tourism. These ten countries are Brunei Darussalam, Cambodia, Indonesia, Laos, Malaysia, Singapore, Thailand, Vietnam, Myanmar, including the Philippines. They have strong political, financial and cultural ties with each other. But their ties are not just for economic purposes alone. Their connection also aims to boost travel and tourism industry – thus not requiring the citizens of ASEAN countries a visa when traveling to another member country (for a limited number of days). The only requirements you need: PASSPORT with six months validity, onward or return flight ticket and hotel bookings (or any proof that you have a place to stay). P.S. Worried about the Philippines Immigration? Here are our tips on how not to get offloaded! Here's the List of all ASEAN countries Philippines Passport Holders Can Visit Visa-Free. Philippine passport holders are allowed to enter Brunei Darussalam for 14 days without the need for entry visas. This is only applicable for tourism purposes. What to see: The capital, Bandar Seri Begawan, is home to the opulent Jame’Asr Hassanil Bolkiah mosque and it's 29 golden domes. The capital's massive Istana Nurul Iman palace is the residence of Brunei’s ruling sultan. Other places that are worth visiting are Royal Regalia Museum, Tamu Kianggeh and strolling at the Waterfront. It is also known for its beaches and biodiversity rainforest protected within reserves. In Cambodia, citizens from the Philippines and other ASEAN countries are permitted to stay for 21 days. All visitors must hold a passport valid for six months and one empty page. What to see: If you are visiting Cambodia, you don’t want to miss going to Phnom Phen (the capital city of Cambodia) because of its rich heritage. In fact, it is a major destination for most tourists. Siem Reap is another popular city where the famous site of Angkor Wat (the world’s largest Hindu temple) is situated. If you are into climbing, then Koh Ker’s 30-meter climb above the plain is something to look forward to. It is located outside of the Siem Reap surrounded by an exotic forest. That’s a lot to look forward to. Known for its thousands of volcanic islands, it is also famous for beaches, volcanoes, Komodo dragons and jungles as the home for elephants, orangutans, and tigers. Philippine passport holders traveling to Indonesia does not require a visa for a 30-day stay. The extension of stay is subject to the approval from the Ministry of Law & Human Rights in cases of FORCEMAJEURE: extremely bad weather condition, serious illness or serious accident. Please keep in mind that all Filipino visitors must possess a Philippine passport with at least six months of validity at the time of arrival in Indonesia and a return/ round trip ticket. Imagine yourself diving into the clear water. Surreal! If you are a Philippine passport holder, you are allowed to travel to Laos for 30 days. Just make sure that your passport will not expire within six months. You will also need to show your tickets for traveling in and out of Laos. A tourist visa will be issued upon your arrival and is usually good for 15 to 30 days (depending on the itinerary of the tourist) – which may be given at airports, Friendship bridges and border checkpoints between Laos and surrounding countries. Just in case you want to stay longer, you can apply at the Department of Immigration of Laos in Vientiane. What to see: If you want to explore the three-tier turquoise waterfalls outside Luang Prabang or visit the thousands of mini wooden Buddhist figures in Pak Ou Caves, then plan your trip to Laos now! Philippine passport holders can travel to Malaysia without the need for a visa if they will only stay there for one month or 30 days. All they need is a valid Philippine passport. If a Philippine passport holder plans on traveling to Malaysia and will stay there for more than 30 days but less than 59 days, he or she will need to obtain a visa before traveling there. The visa applied for will be free of charge. A Philippine passport holder will also need a visa if they will travel and stay in Malaysia for 60 days or more. They will have to get a visa with reference (VWR) before their planned travel to Malaysia. Their contacts or host in Malaysia will also have to secure for them a letter of authorization or approval for VWR from the Malaysian Department of Immigration. The original letter of approval will be included in the visa application. Ordinary passport holders from the Philippines can stay in Myanmar without a visa for 14 days, granting Filipinos who are holders of ordinary passports visa-free entry to Myanmar for tourism and business purposes, The Philippines already grants Myanmar nationals a 30-day visa-free privilege under Executive Order 408, which was signed in 1960. The visa exemption deal is seen to boost tourism in Myanmar, a country full of tourist attractions but struggling to lure more visitors. If you want to visit the Golden Triangle (the borders of Myanmar, Laos, and Thailand) or just want to explore Yangon Central Railway Station, then a trip to Myanmar is a must! Philippine passport holders can be issued visas on arrival in Singapore, for stays of up to 30 days, whether for touristic or business purposes. Your Philippine passport should at least have six months validity after the date of intended departure from Singapore. Travelers should also have their confirmed return airline ticket and proofs of sufficient funds for the duration of stay in Singapore. Get ready, Merlion! What to see: if you want to explore Singapore's Civic District from natural views at Merlion Park's Marina Bay to the impressive Thian Hock Keng Temple, then plan your trip to Singapore, today. The good news is you can stay in Thailand for 30 days at maximum. Visitors can now regularly go to Thailand and stay there within a total of 90 days in a six-month period, again, you are only allowed 30-days maximum on each visit if you will be entering the country via their airport or 14- days if traveling by land. So, plan your trip carefully ahead of time. What to see: If you intend to visit the Grand Palace, or The Damnoen Saduak Floating Market, or just experience the famous Thai Massage, then book your flight to Thailand, now. Filipino citizens are permitted to travel and stay in Vietnam for 21 days or less as tourists. Your passport should be at least valid for six months, and you should have a confirmed return ticket and enough money to cover your expenses for the duration of the stay. A fully accomplished and duly signed Visa application form with one original and recent 2” x 2” photo attached is necessary. What to see: If you want to see how did the Americans lose the Vietnam War by exploring Cu Chi Tunnels or if you are a backpacker who wants to visit Pham Ngu Lao Street because of its war memorabilia and other merchandise then go ahead and book your flight to Vietnam! The visa-free entry agreement is expected to boost tourism, trade, and investment between the Philippines and all ASEAN countries.Before you go on with your European or World Tour, start with the ASEAN countries first. If you must know, each country has its own culture and heritage that will make you embrace your Asian roots.